For most Americans the thirty days (or thereabouts) between Thanksgiving Day and Christmas Day are the days we are subjected to constant advertising for holiday gifts and the countdown of the number of shopping days until Christmas. As an aside – for those too young to recall – we used to count shopping days instead of simply the number of days remaining because most stores were not open 7 days a week. Hence the number of shopping days was less than the number of days by an amount equal to the number of Sundays in that time frame. Since those familiar with Freeport already know what a shopping Mecca it is, it will come as no surprise that there is a lot going on in town during those 30 days! 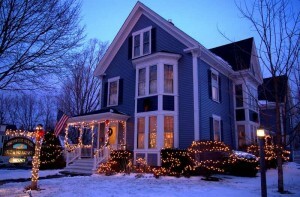 Throughout most of that time (Now through December 19, 2009) Brewster House Bed & Breakfast is offering its Shop, Dine & Stay package, with two nights double-occupancy in a queen room, an L.L. Bean gift card, a gift certificate at Azure Cafe, for only $499 (taxes included), and the ability to add a third night for only $100. In addition, Freeport’s Moonlight Madness event begins in the wee hours of Friday morning, November 27, with many stores open, special events, sales, etc. This is traditionally the biggest shopping day of the year, and only Freeport can do it all up with L.L. Bean’s stores, and other shops and restaurants. A week later is Sparkle weekend in Freeport. An entire weekend of holiday fun for the whole family! The weekend begins with a parade of lights down beautiful Main St., decorated to look like a scene from a Christmas card. The celebration will include a tuba concert, jingle bell run, craft fair, hot cocoa stops, talking Christmas tree, Wally the Green Monster, and of course… SANTA!!! From November 20 through New Years Eve is L.L. Bean’s Northern Lights Celebration. It begins with the lighting of the giant Christmas tree, and includes book signings, demonstrations, ice carving and special events, leading up to a huge New Years celebration for the entire family. Freeport’s over 170 shops and restaurants will be open with values galore, throughout the holiday time, and with the new stores in Freeport Village Station adding to the mix, there is truly something for everyone on your Christmas shopping list. Of course, if you’re not busy shopping for holiday gifts, and can wait… there are the after-Christmas sales. Like most places there are sales in Freeport after Christmas. However, after New Years there are even more, and then in late January and February, still more!! But that’s a closely guarded secret, so we better not say too much about that!